By Michael McCarthy, CEO, ISEA. A very special word of thanks to those of you who attended our annual conference, Solar Ireland 17. The 2 day event had 300 attendees and provided a high-level platform for the best and brightest minds to interact, network and engage in all matters solar. The welcome address from An Taoiseach Leo Varadkar and keynote address by Minister Michael Darcy set a gold standard for the subsequent 2-day discussion ably complemented by the experiences of former Energy and Environment Ministers Alex White and Alan Kelly. The impressive panellists delivered cutting edge contributions that reflected experience and ambition for the solar industry in Ireland. The quality of presentations and enthusiastic participation from delegates has sent a very clear signal to policy makers and markets that solar in Ireland will be successful. 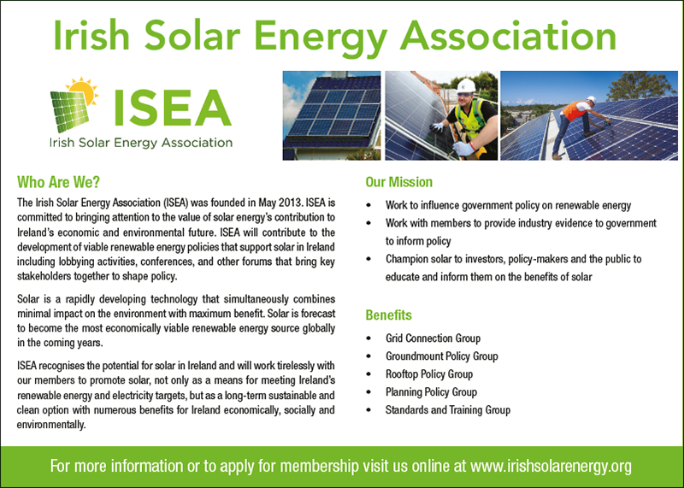 The success of conference augurs well for ISEA in 2018 and renews confidence in our sector at a critical juncture given the imminence of RESS and its expected onward journey to DG competition early in the new year and provides a basis on which to increase membership to further strengthen our resolve to advance our objective to establish a strong native and viable solar industry in Ireland. I look forward to an exciting and challenging year ahead and in the meantime let me take this opportunity to wish you a bright & prosperous new year. A report from the All-Party Parliamentary Group (APPG) on Energy Storage, released at the group’s Winter Parliamentary Reception in the House of Commons, analyses policy change in the UK and estimates that by the end of 2021, 12 GW of battery storage deployment is possible. The Renewable Energy Association, the report’s authors, estimates that in 2016 only 0.06 GW of battery storage was installed and operational in the UK. 12 GW of battery storage, it is argued, would have a positive impact on UK energy security, would support the creation of domestic battery manufacturing and would support the export of cutting-edge low-carbon products and services post-Brexit. The report looks at a range of factors, including projections for battery cost decline and proposed policy changes from the Department for Business, Energy, and Industrial Strategy, the energy regulator Ofgem, and National Grid, and lays out three scenarios for battery storage deployment by the end of 2021. The report analyses battery storage deployment onsite at established solar PV and onshore wind farms, at electric vehicle charge points, connected to the transmission system, and behind-the-meter (domestic). The report cautions that battery storage cost reductions and public popularity should not be underestimated in the way that solar PV was in the UK. The two technologies share similar characteristics in that they benefit from massive cost reductions due to a rapidly expanding global supply chain, are popular with consumers as they can assist in reducing bills, and empower consumers to generate their own low-carbon electricity. In 2011 Ofgem projected that nearly 7 GW of solar PV would be installed by 2030, but instead 12 GW was deployed by 2016. National Grid’s most optimistic forecast in Future Energy Scenarios 2017, the “consumer power scenario,” forecasts 10 GW of deployment of energy storage by 2050 (which may include the existing 2.8 GW of pumped hydro currently operational). The group acknowledge the role for long-duration storage such as pumped hydro but do not include it in this analysis. The Officers of the APPG on Energy Storage are Dr Alan Whitehead MP (Lab), John McNally MP (SNP), Lord Teverson (LibDem), Hywel Williams MP (Plaid Cymru), and Alan Brown MP (SNP). Government reforms of the Capacity Market, announced by The Department for Business, Energy, and Industrial Strategy, will limit the amount of innovative new battery storage capacity that will be able to compete in the auction. Lightsource has grown in just seven years to become one of Europe’s largest developer and operator of utility-scale solar projects. The company has commissioned 1.3 GW of solar capacity to date and manages approximately 2GW of capacity under long-term operations and maintenance contracts - the equivalent of powering over half a million homes through clean energy. Twenty homes in Dingle, Co. Kerry, are to test the potential of a new storage technology to support the use of variable renewable energy supply resources and smart connection to the Irish electricity grid. The new €1.12m StoreNet project was officially launched at an International Energy Research Centre (IERC) industry workshop at Tyndall National Institute this morning. StoreNet will install residential battery storage systems to operate in the form of virtual power plant in Dingle to integrate with energy supply and demand management and operate at scale across a community. StoreNet is an industry-led collaborative research project that includes Electric Ireland, ESB Networks and Solo Energy and demonstrates battery-based energy storage within Irish homes on the Irish grid. The project aims to reduce energy costs for residents, relieve pressure on the grid during peak times, and contribute to our transition to a sustainable energy future. Residents who generate electricity from renewable resources on their premises will store excess energy in the battery, and deploy their stored energy rather than energy from the Irish grid during peak times. Additional ‘smart’ charging of the batteries during off-peak times will not only relieve pressure on the grid but will also reduce the cost of supply to the residents. From a commercial perspective, the project will identify the energy services that can be delivered by a distributed energy storage network and assess the business model in terms of 100% renewable electricity, retail sales and grid services. StoreNet is an industry-led collaborative research project that demonstrates battery-based energy storage within Irish homes on the Irish grid. StoreNet is a targeted demonstration project for more mature, but not yet widely deployed, energy storage technologies in the Irish residential sector, and will contribute to the transition to a sustainable energy future, while delivering value to consumers, renewable generators and grid operators. The demonstration project will provide an assessment of Ireland’s potential for small scale storage and could lead to significant cost reductions, aiding further decreases in energy storage costs and accelerating development. The International Energy Research Centre (IERC) is an industry led, Irish Government supported Energy Technology Centre. Hosted in Tyndall National Institute at UCC, the Centre delivers world leading collaborative research to meet global societal needs for secure, affordable and sustainable energy services. It addresses energy systems integration challenges. ESB Networks employs over 3,200 people from specialist network technicians on the front line connecting, maintaining and repairing the electricity system for Ireland’s homes and businesses to engineers, data scientists and IT professionals utilising emerging technologies to create one of the world’s smartest and most resilient energy networks. Electric Ireland is the retail division of ESB (Electricity Supply Board). Recognised as Ireland’s leading energy provider, Electric Ireland supplies electricity, gas and energy services to over 1.2 million households and 95,000 businesses in the Republic of Ireland and Northern Ireland. Solo Energy is a new low-cost 100% renewable electricity supplier business. Wirsol Energy, the company responsible for the UK and Australian markets within WIRCON Group has announced that it has acquired the project rights for two new projects that will be constructed and connected to the grid during the first half of 2018. Construction will begin in January 2018 and WIRSOL is in the final stages of securing a long term PPA and debt such that these projects will be held within the group. These projects form the beginnings of a portfolio of circa 150MWp that will be built over the next 12-18 months. The portfolio will consist of six projects ranging in size from 7MWp to circa 45MWp. This acquisition follows on from the recent announcement that WIRSOL’s joint venture with HIVE Energy for the development of the Cleve Hill Solar Park. With a proposed DC Capacity exceeding 350MWp the project is designated as a Nationally Significant Infrastructure Project; currently in the consultation phase planning submission is scheduled for mid-2018. BSR has been appointed to manage Westmill Solar Park, the pioneering community-owned solar project. The Government’s long awaited Clean Growth Strategy has been published with limited early opportunities for solar power, despite solar's status as the UK's most popular energy source, and as one of the cheapest, with the largest future world market. While the cost reductions in solar are cited several times in the Strategy there are no new measures to boost current deployment which has plummeted and which has been kept afloat by progressive planning policies by some local authorities. The industry has been waiting over a year for clarity on the FIT Review and the clean power auctions. Major job losses have been incurred in the industry which employed 34,000 people just a few years ago. The central role of solar in any modern economy means that solar power is implicit in many of the policies, such as smart systems, public sector emissions reduction, EV charging, retrofitting existing properties, Green Mortgages and industrial sector efficiency, although there is little detail on when and how these new proposals will be implemented. STA Policy Manager Chris Hewett said; “It does seem extraordinary that when a technology as vital to the world's future as solar is asking, not for any new public support, but for simply a level playing field with other technologies that the Government is not moving to respond. This technology will dominate global power supply in years to come so in the interests of UK plc, the Government needs to stop putting the UK solar industry at a competitive disadvantage. "Whether it is tax breaks for fossil fuels, a continued emphasis on big centralised power over local power, or access to auctions - solar is not being treated fairly. Solar empowers local people and communities, and it stimulates smart innovation more than any other energy technology. That's why communities and City leaders all over the UK want to see the Government support solar power. The British solar industry is being artificially held back by the Government and that doesn't help consumers, innovation or local leadership.' We will be looking to the Autumn Statement for the measures we need urgently to level the playing field for solar power.” The solar industry has been left to continue fighting for a level playing field, including for the same tax benefits available to some fossil fuel technologies in the UK, such as business rate exemptions and 100% Enhanced Capital Allowances. There has only been one solar farm built this financial year, cited in the Strategy. Domestic rooftop deployment in 2017 stands at 20% of the 2015 market and commercial rooftop at 15% of 2015 deployment. In a further surprise Government is allowing onshore wind on Scottish Islands to be made eligible for Pot 2 'less established' auctions, while solar has been shut out of clean power auctions for 2.5 years. The STA revealed it has written with major investors in solar power urging the BEIS Sec of State to bring forward a new auction round for solar power, where contract prices of £50-£54MWh are anticipated - half the price of the Hinkley contract in today's prices. 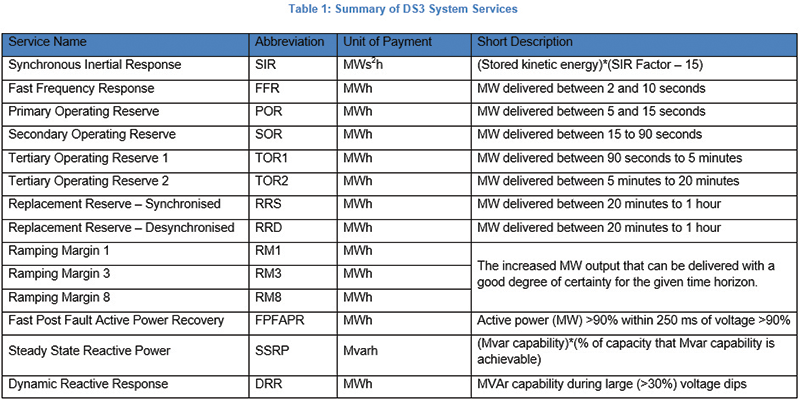 The STA has also previously argued that solar + storage should be eligible for Pot 2 auctions. 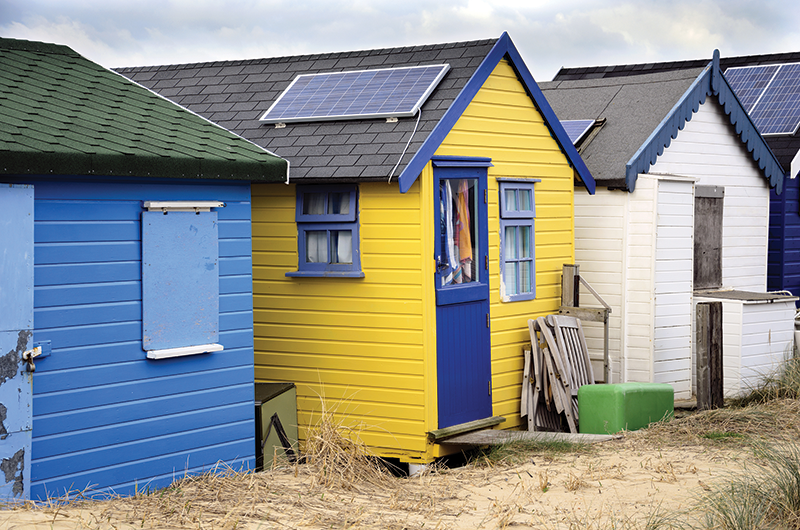 STA Chair Jonathan Selwyn said; "We will be looking carefully at the implications of this and the continued exclusion of solar power despite State Aid Rules." There are several aspects of the Clean Growth Strategy where solar will benefit and where solar will be crucial for delivery in future including; Green mortgage products; business energy productivity targets; industrial energy efficiency; domestic retrofits to level Band C 'where affordable'; EV charging networks; public sector carbon targets and smart systems. The STA looks forward to engaging with BEIS on the detail of how these can be effectively delivered. STA Chair Jonathan Selwyn said; “Solar power is transforming global energy systems. Until this year, the UK was at the vanguard of this movement. It therefore beggar’s belief that the government’s Green Growth Strategy almost totally ignores solar power - the most popular and cost-effective means of driving the UK’s energy transformation. We call on the government to shake off its blinkers and provide a level playing field for all energy technologies to ensure the solar industry, consumers, local people and the environment get a fair deal. This will enable solar to take its rightful place at the heart of clean growth." As traditional fuels are phased out, the need to provide sustainable energy offers a huge opportunity to develop and invest in smart technologies according to a whitepaper from Frost & Sullivan and Hitachi. Across the world, the need for a secure, stable and affordable energy supply continues to sharply rise. According to a whitepaper from Frost & Sullivan and Hitachi, global energy demand is set to increase by 55% by 2040. Cities consume 75% of global energy and with these only set to expand, the energy industry is faced with a significant challenge: how does it meet this demand without harming the environment? An answer to this lies in Social Innovation, whereby new technologies and business models are leveraged across the energy industry to improve efficiency and sustainability. In doing so, this allows governments, businesses and individuals to satisfy the ever-increasing demand for energy whilst simultaneously minimising the impact on the environment. As traditional fuels are phased out, the need to provide sustainable energy offers a huge opportunity to develop and invest in smart technologies which can be used in the generation, distribution, consumption and management of energy. Increasingly effective renewable energy, alongside the integration of data into energy grids and management systems, are all examples of innovative technologies which are helping to provide cleaner and more efficient energy, reducing emissions whilst meeting rising demand. People are increasingly producing more of their own energy via renewable means, such as solar panels and wind turbines. This is giving people more control over their energy. 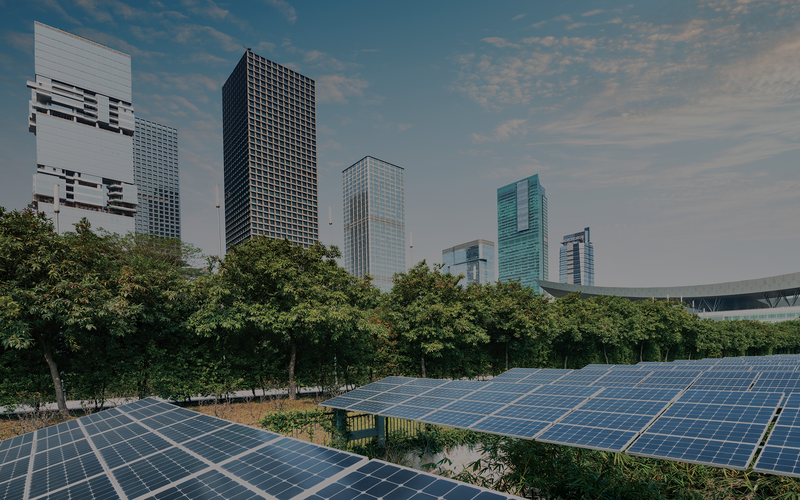 The creation of microgrids is enabling people to disconnect themselves from the power grid and operate autonomously off their own local energy generation, offering them more energy independence. The installation of solar panels, for example, gives the home owner exclusive control over their home generated solar energy and the power to decide whether to consume it or feed it back into the grid. Smart grids and microgrids are reducing energy costs whilst being more environmentally friendly. Smart grids demonstrate in practice how digital intelligence is transforming the energy industry and driving energy efficiency. Smart grids are powered by demand response (DR) models, which enable a real-time analysis of customer demand trends. The digital intelligence integrated into these models allows them to autonomously react to energy demand and adjust distribution of energy accordingly. For example, if at a certain point of the day the DR model detects a low demand for energy, it will lower the amount of energy it is distributing. DR models enable smart grids to control energy demand more efficiently and distribute energy more effectively. The ability of this model to adapt to our needs demonstrates how big data can contribute to energy savings. DR models are set to transform how we manage our electricity, with an expected investment, predicted by a whitepaper on Social Innovation in Energy by Hitachi and Frost & Sullivan, of $10 billion in DR programs by 2020, as they help countries reach their emission targets whilst contributing to providing cleaner and more efficient energy during peak times. 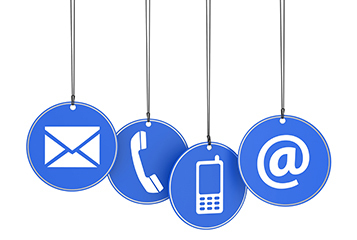 Smart meters allow a two way communication between the points of generation and consumption. Wireless technology enables smart meters to commute information about energy consumption, such as meter readings, to the supplier. The supplier can then react to these and optimise energy generation. This will reduce costs and also be good for the environment as less energy is unnecessarily wasted. The vast global growth in smart meters is evident of their potential and how they are driving energy efficiency. The Social Innovation in Energy whitepaper found that at the start of 2015, there were 510 million smart meters installed globally; this number is set to increase to 980 million by the end of 2020 and 450 million of these will be in China. Virtual Power Plants (VPPs) allow different energy sources to be integrated into a centrally controlled network. The digital intelligence of this central network can monitor and control energy distribution. It allows the VPPs to deliver energy from more than one power source when energy demand is at its peak. This is essential due to the rise of renewable energy, which does not necessarily generate electricity twenty-four hours a day; for example, solar energy can only be captured during the day and so another power resource is needed to balance this out. VPP solutions are taking power aggregation to a new level as well as taking pressure off vulnerable networks, increasing the reliability of grids to satisfy our energy needs. 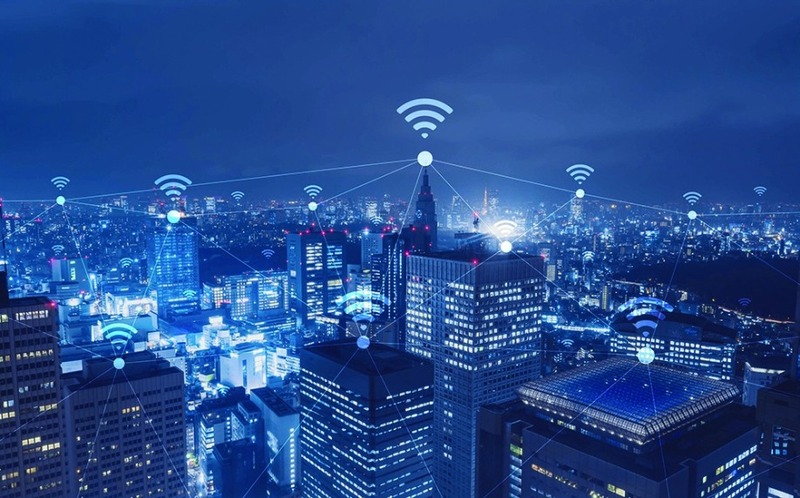 The concept of the ‘Internet of Buildings’ demonstrates how innovative energy solutions will ultimately be able to be deployed across a whole smart city. Digital solutions will enable energy to be shared across buildings in the grid, which will optimise energy distribution, usage and efficiency. The integration of IT into smart energy infrastructure will demonstrate how the distribution and consumption of energy will be optimised through interactive grids. Enabled by the digital transformation of the energy sector, we will see a future where Social Innovation will integrate renewable energy into smart grids and create reliable and clean energy. Social Innovation provides huge opportunities for businesses, consumers and society. It will encourage all three groups to invest in sustainable solutions which will reduce costs and enhance their control over their energy usage, whilst helping the environment and making the world a more sustainable place. Growth predicted from rising interest of consumers in automation and increase in affordability of smart technologies. According to market research report published by P&S Market Research, the Smart lighting market is forecasted to reach $27 billion by 2023. The growth is attributed to the rising interest of consumers towards the adoption of automation technologies such as internet of things (IoT), and increase in affordability and availability of smart automation technologies, Smart lighting is categorised into lighting source, communication medium, product, application, and service. The market is driven by the new innovations and rapid increase in sales of smart LED solutions. In 2016, LED as an efficient lighting source contributed the largest revenue to this industry and it is expected to witness highest demand during the forecast period. Apart from this, advancements in LED based lighting technology through adoption of IoT and wireless lighting techniques is escalating the smart lighting market growth. For example, recently Osram Licht AG launched SIMPLUX, an LED based smart control system designed for small and medium sized spaces to provide enterprise level control and automation capabilities. Based on wireless lighting communication, Wi-Fi technology generated highest revenue in the market and Wi-Fi based lighting communication is also projected to witness fastest growth, during the forecast period. However, the market for booming technology Zigbee in lighting industry will pace up with similar growth as that of Wi-Fi. Zigbee, developed by a alliance of companies to create wireless solutions for energy management, allows users to control home lighting from a smart device, such as a phone or tablet. Being low in cost and power consumption, the technology is becoming a factor of interest among manufacturers. On the basis of service, lighting as a service (LaaS) is expected to witness higher demand as compared to smart phone application, during the forecast period. Its market is projected to cross $17 billion mark by 2023. Consumers, particularly medium and small-scale users of smart lighting are attracted more towards subscription based and pay as you go lighting models provided by various vendors in the market. Geographically, Europe has been the largest smart lighting market, accounting for more than 35 percent of revenue in 2016, whereas the sales in Asia-Pacific is expected to witness the fastest growth, during the forecast period. The growth in Asia-Pacific will be led by factors such as surge in digitalisation within industries, advancement in new lighting technologies by regional players, growth in investment in smart lighting market, and increasing adoption of connected technologies across indoor and outdoor sectors. Further, due to rapid technological advancements in IoT and improvement in network infrastructure, the region has high tendency to adopt smart lighting solutions as a mainstream alternative to traditional lighting, in the near future. Major four-year research project aims to ramp up the commercialisation of new products and processes across the renewable energy sector in Northern Ireland, Ireland and Scotland. ‘Renewable engine’, a ground-breaking cross-border research and innovation ‘supercluster’ which will deliver focused research and innovation support to companies specialising in renewable energy and advanced manufacturing and engineering across Ireland and Scotland, was officially launched 28 November 2017. Speaking at the launch at South West College’s Dungannon campus, Alistair Quinn, Renewable Engine Programme Manager, said: “Innovation, often driven by market need and technological advancement, is almost always created within commercially-focused, forward-thinking companies – but not every company has the dedicated research and collaborative support it needs to advance this in a way or within a timescale they would like. 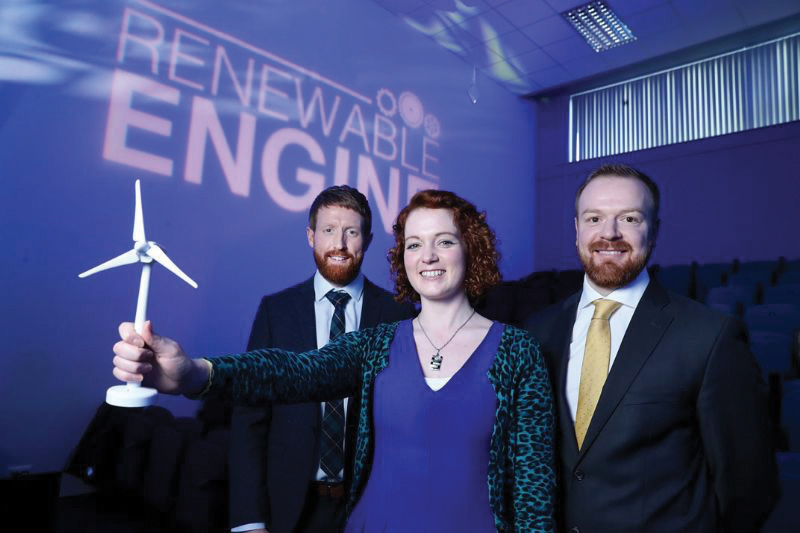 Powering a renewable future: Pictured (L-R) Alistair Quinn, Renewable Engine Programme Manager, Rachel Coulter, Post-Doctoral Researcher at South West College and Paul Boylan, Programme Manager at SEUPB. Solar PV is poised to become one of the most important energy technologies in the fight to meet global sustainable energy and climate commitments says Brian Denvir, Clean Energy Specialist Sustainable Energy Authority of Ireland (SEAI). One perspective that has been missing from the debate is the significant economic opportunity that exists for Irish research and industry to stake a claim to the global solar PV supply chain. 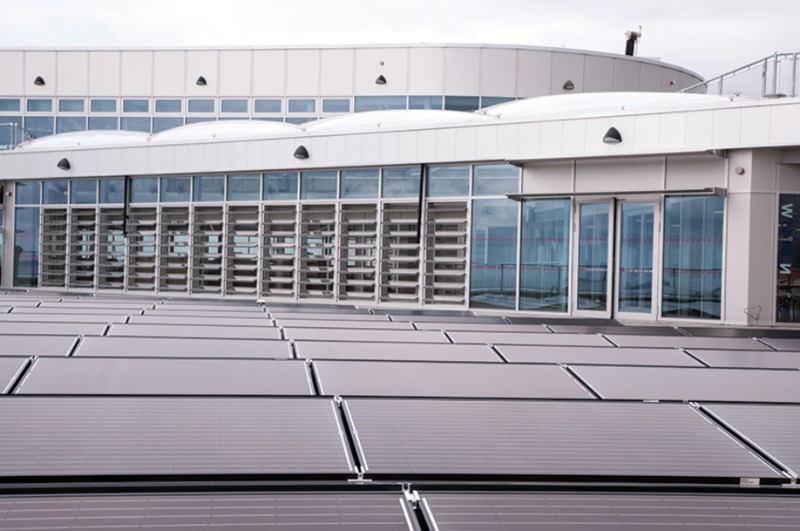 A new report by SEAI estimates that by 2030 Irish business could capture up to Ä200 million annually of a European solar PV market worth Ä10bn. Irish organisations are already active in niche areas across the global solar supply chain and the report identifies considerable scope to build on these. Ireland does not immediately seem like an obvious contender to become an exporter of services, components and products to solar installations across the world. We have well-established supply chain strengths in wind, bioenergy and wave technologies*, but Ireland is not recognised for its role in the solar sector. 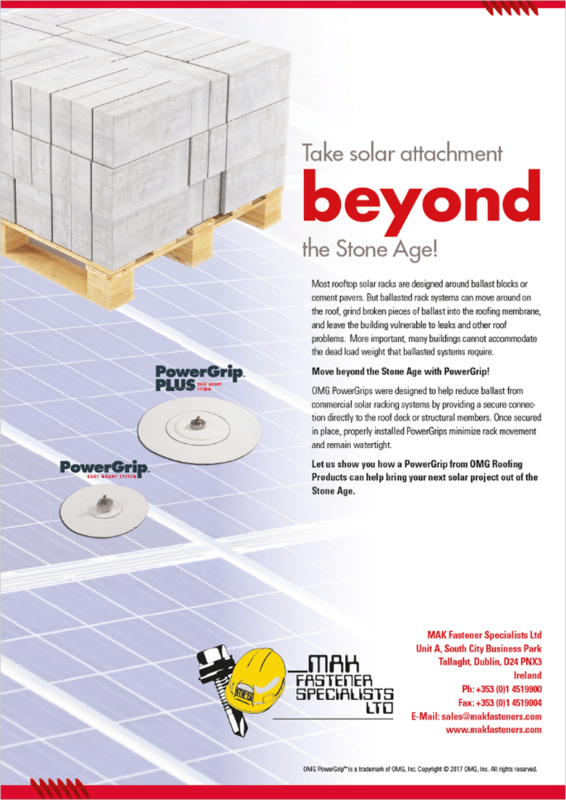 Competition in the conventional solar supply chain. Competition in the conventional solar supply chain is fierce. Production of the most commonplace silicon solar panels is dominated by a handful of manufacturers in China and Taiwan. 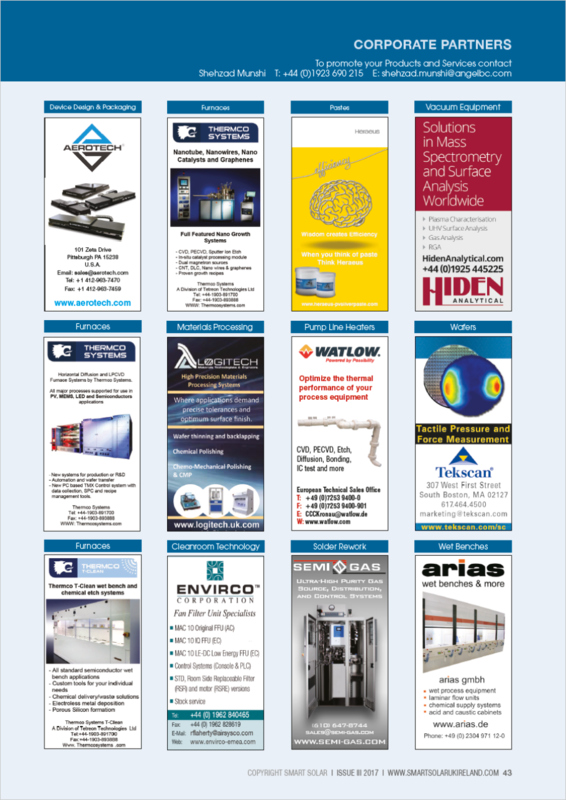 There is a range of well-established incumbents who provide components such as inverters, racking, wafers and glass. Silicon modules have become commodified and there appears to be little space for new market entrants. The door, however, is by no means closed to Irish industry and research. Firstly, silicon module manufacturers are under immense pressure to deliver efficiency gains at lower cost. This means there is still scope for delivering marginal gains in efficiency through innovative processing techniques. Fortunately, Ireland boasts considerable know-how in semiconductor processing. One start-up, Nines Photovoltaics, specialises in silicon wafer etching and is attracting attention from international solar module manufacturers seeking these marginal gains. Providing licensing of innovative technology, like this one, to tier one manufacturers could prove lucrative. This is due to the fact that the PV modules can account for almost half of the total investment in a solar installation. Secondly, there are a range of promising PV technologies and applications that Irish research and industry are well-placed to support through to commercialisation. Irish research institutions have a strong pedigree in materials science research. In particular, demonstrating know-how in a range of emerging photovoltaic materials, including perovskites, quantum dots, and organic semiconductors. Such materials can be integrated into a range of applications, producing energy in products such as wireless sensors or consumer electronics. 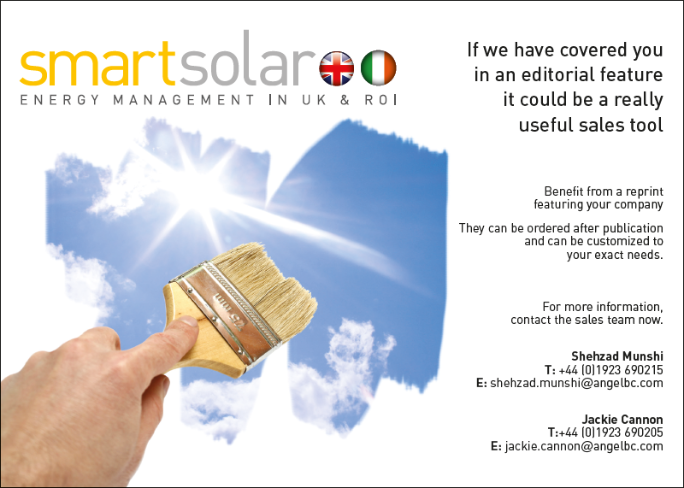 One application in particular that Irish firms could target is Building Integrated Photovoltaics (BIPV). This is a system that consists of solar cells or modules that are integrated in building materials or elements as part of the building structure including materials such as glass, tiles and facades. There has been much excitement about BIPV products such as Tesla’s solar roof tile. So far however, the market has failed to fully deliver. There are challenges with scale, cost, and most importantly, finding an efficient route to market. Technical breakthroughs are bringing the technologies closer to commercialisation. Several companies in the US, for instance, are developing the distribution channels needed to find a sustainable customer base for their products. There is scope for Ireland to become both a developer of and a test-bed for these products, given the combination of stringent building regulations, a strong building materials sector, and cutting-edge research into suitable solar materials. 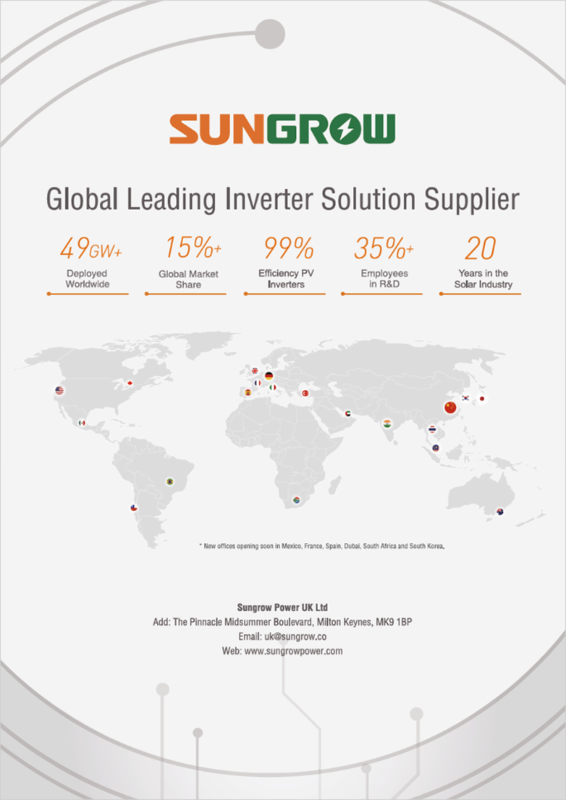 As the global PV market grows, so too does the range of products and services supporting it. Irish businesses can carve out niche areas for themselves within a huge global market, by focusing on existing Irish strengths such as ICT, materials science, photonics, process engineering, storage and building materials. This new report from SEAI offers views from Irish stakeholders in the sector on how best to maximise this opportunity, including establishing stronger ties between research and industry, and targeting research funding towards the priority areas identified. 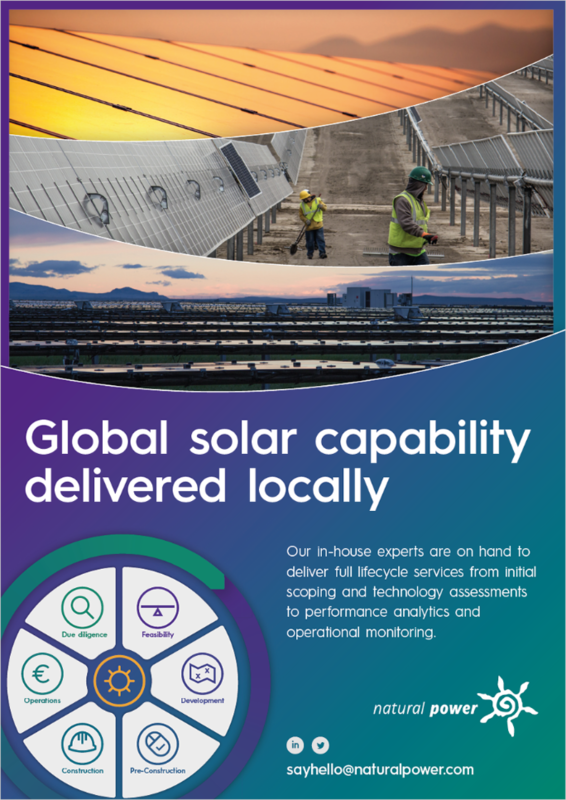 The report also profiles some of the Irish innovators already active in the global solar supply chain and those working to develop new technologies and applications. In the ongoing debate about the role of solar PV in meeting our own energy demands, it’s worth recognising that Ireland can be more than just a technology taker in this sector. By recognising where our strengths lie and playing to these, the outlook for solar PV could be very sunny indeed for Irish business. With energy networks adjusting to a greater share of renewables in the energy mix, commitment to technological innovation will ensure that solar will deliver reliable and flexible electricity in any grid conditions. By Alison Finch, Chief Marketing Officer, Huawei Solar Europe. As the share of renewables, such as solar and wind, in the global energy mix continues to grow, the effects that intermittent forms of energy generation place on grids has been a frequent topic of industry debate. As a result, it is perhaps less commonly known that solar PV plants are capable of delivering critical grid support services. Companies across the industry are increasingly collaborating on projects and innovating new solar technologies, which are able helping to improve the flexibility and stability of energy networks, just as Huawei FusionSolar and Wirsol did with the Lisburn Solar Park in Northern Ireland. One vital component of grid reliability and stability is system inertia. This is the energy stored within the high-mass rotational equipment of certain forms of generation, in particular conventional fossil fuel generators. This stored energy is used by grid operators for balancing services if there are any sudden changes in supply, or as back up during known peak times – such as during the adverts of X-factor, when everyone gets a cup of tea. As variable generators such as wind and solar have become more prominent, the proportional amount of system inertia present on large-scale energy networks has reduced, which can result in an irregular power supply and sometimes complete power outages. It has therefore become increasingly important to know the precise levels of system inertia present on certain grids, particularly because drastic decreases in inertia would result in higher costs of procuring reserve services through any of the National Grid’s current framework. In order to facilitate grid inertia, the Northern Ireland Distribution Code aims to promote competition in the generation and supply of electricity through permitting the development, maintenance and operation of an efficient, co-ordinated and economical distribution system. In order to maintain a consistent inertia, and become compliant with the Northern Ireland Distribution Code, PV plants must be able to supply or consume reactive power, even when the site is exporting at full capacity. In order to achieve this, Wirsol, a leading global solar energy equipment provider, partnered with Huawei FusionSolar to create a software adaptation, in order to help the Lisburn Solar Park abide by the Northern Ireland Distribution Code. Typically, solar inverters supply or consume reactive power at the expense of active power, therefore prioritising the reactive power requirements. 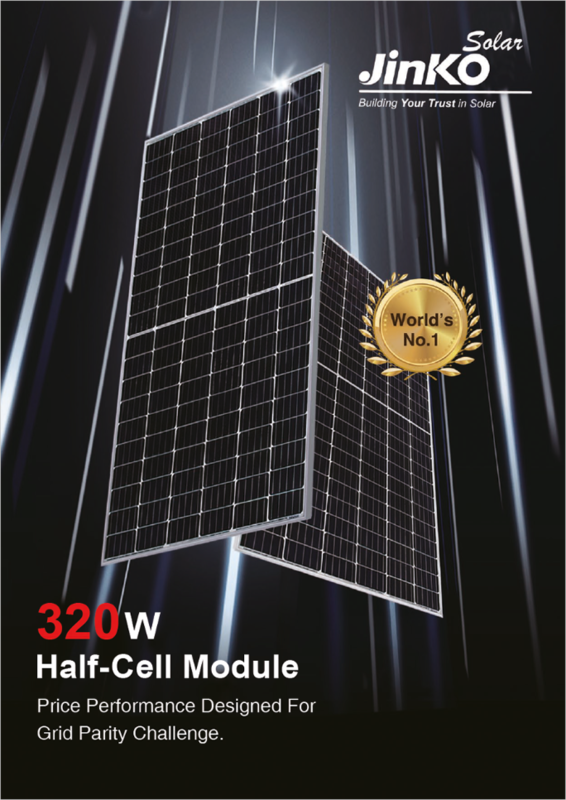 In order to develop an innovative solution capable of delivering functionality that is not offered by other products on the market, Huawei Solar collaborated with Wirsol to adapt the firmware and software inside its SUN2000 36KTL string inverters. 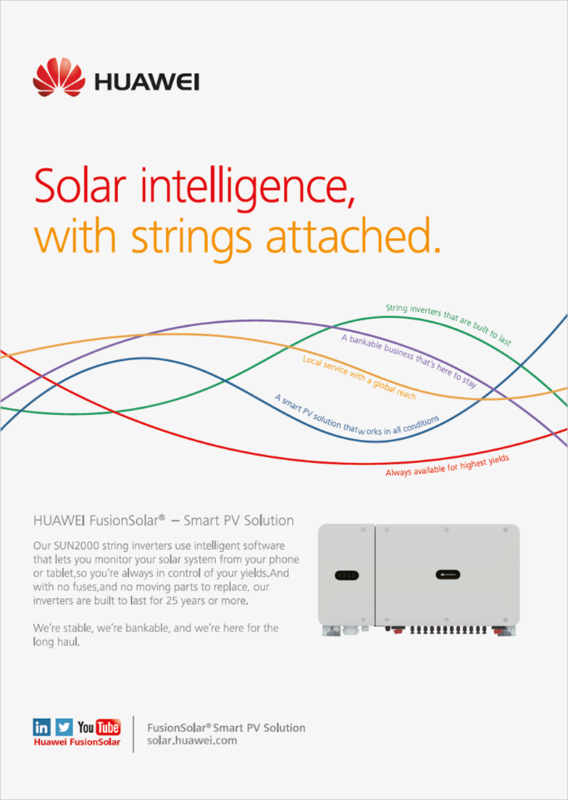 Huawei’s firmware and software adaptation enables the solar plant to supply or consume reactive power without reducing active power. Therefore, the 36KTL is able to produce or consume reactive power, even if the active power reaches its maximum, therefore allowing operation within a grid that that mixed with other renewables such as wind. As a result, the reactive power capabilities have been greatly improved, and whilst efficiency will be monitored over time, it is currently predicted to exceed the guaranteed performance ratio of 82%. The project has been deemed a success as the 16.92MW Lisburn Solar Park received the Provisional Acceptance Certificate (PAC) and the Northern Ireland Energy Committee approved the solution for full reactive power compliance. Furthermore, the 36KTL also delivers additional benefits for the project due to its low running costs. It also helps to keep installation costs low by minimising the low voltage and communication cable requirements. 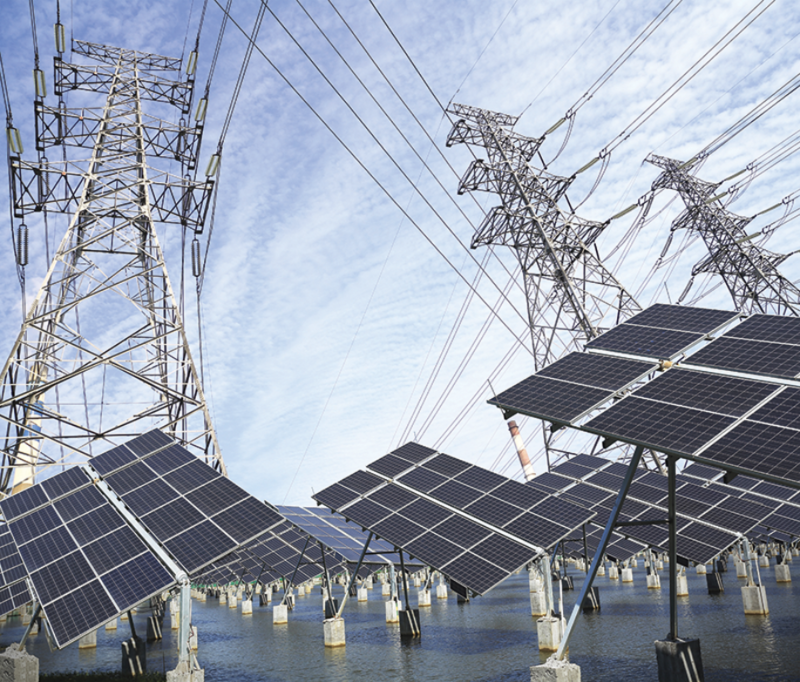 As older conventional coal and gas plants continue to be displaced by renewable generation, it is becoming increasingly important for solar companies to develop technologies that are capable of delivering grid support services. The 36KTL solution developed by Huawei and Wirsol is a useful reference point for how collaboration and innovation within the sector facilitates projects that provide enhanced grid support, stability and increased grid resilience. With energy networks across the globe adjusting to a greater share of renewables in the energy mix, commitment to technological innovation will ensure that solar is a technology capable of delivering clean, reliable and flexible electricity in any grid conditions. Low Carbon is a renewable energy investment company, investing in, owning and operating renewable energy products. Quentin Scott, Marketing Director of Low Carbon, talks about the London Solar Strategy and what it has in store. Historically, London hasn’t excelled in the deployment of solar PV. Research from the Green Alliance points to just 66MW of solar PV installed across the capital – the equivalent of one solar panel for every 200 homes. And recent figures from the Department for Business, Energy and the Industrial Strategy have shown that London is lagging behind in the use of what is a proven technology, and home to far, far less than one percent of the UK’s solar capacity of 12GW. There are a number of reasons why. Space in the capital is at a premium and makes utility-scale developments difficult at best. The high number of rental properties in London have also played a factor. Many landlords are reluctant to invest in solar installations that will have no direct benefit to them, given it will be their tenants that will likely be paying the utility bills. Meanwhile, well-publicised reductions in the incentives from central government to install solar panels since 2015 have impacted on the sector. And many installers, recognising the opportunities elsewhere in the country and the challenges in London, have focused their operations and marketing strategies outside the capital. On the other hand, the cost of solar panels is falling. Some of the largest ground-mounted sites can now operate on a subsidy-free basis. And, if the ambitions of the Greater London Authority can be realised, we could see London contribute towards bringing down the costs of rooftop installations more generally. In August, Mayor Sadiq Khan launched the London Solar Strategy as part of City Hall’s broader environmental plan. That in and of itself was a positive sign that City Hall recognised not only the limited solar take-up, but the urgent need to increase installation levels. That need was born out of two fundamental elements. Firstly, a need to encourage consumers to reduce their energy costs at a time when prices have very publicly risen, the cost of living is going up, and wages have largely remained stagnant. Secondly, the urgent need to increase low-carbon electricity production in order to cut CO2 emissions that have caused London’s pollution levels to hit dangerously high levels, prompting multiple public warnings. Critics of the plan argued it simply didn’t go far enough. The headline figure and commitment within the strategy was to the deployment of 100MW of solar by 2030. While that would double existing capacity, it arguably speaks more to the low uptake of solar in London to date. But while that headline figure might not have set many pulses racing, there were some encouraging signs from City Hall that it’s willing to deploy innovative solutions to initiate higher uptake of solar PV. Most notably, the introduction of a reverse auction for homeowners will help to deliver the best price for Londoners. Following a pilot programme in Norwich, the GLA will approach households to gauge their interest in installations, then pooling expressions of interests into lots to be auctioned to installers. The result will hopefully be affordable solar PV for many homes, and if the results in Norwich can be replicated – an 83 percent increase in installation – then we could see more solar panels in London. The strategy also commits to better deployment of solar across the GLA estate using the RE:FIT programme, and the creation of development of community energy schemes, supported by £300,000 in grants funding. So, what should we make of the London Solar Strategy? In the short-term, solar panels aren’t going to be a mainstay of the London landscape. And we should think of 100MW of solar capacity as a target a great city like London should reach and exceed well in advance of a 2030. But we should look at the strategy as a positive step in the right direction and a recognition by the Mayor and his team of the need to get carbon emissions and to do so through the use of low-carbon electricity driven by increased solar PV. The GLA is capitalising on positive results elsewhere in the country, and if these are replicated, we can challenge the historic issues that have held solar back in London. The performance and affordability of new energy storage systems will earn them a pivotal role in the evolution of energy grids and double-digit growth potential through 2025, analysts say. Energy storage is fast becoming the technology around which both legacy electric power utilities and renewable energy advocates can agree: batteries are the future. Part of the reason for the rapid ascent of energy storage is technological advancement paired with market forces that are driving down prices. Its growth is also due to benefits that cut across traditional, centralized energy generation boundaries and the territory of renewable power generation platforms that stress the advantages of energy independence made possible by decentralized distribution strategies. Consider the UK’s Energy Storage Network and its call for 2 GW in storage capacity by 2020 to frequency balance power loads – that goal will likely be reached in 2017, almost three years early. Mainstream governmental agencies in the UK including its Business, Energy and Industrial Strategy (BEIS) agency and regulator Ofgem (Office of Gas and Electricity Markets) support storage as well, according to James Court, a spokesperson for the Renewable Energy Association (REA). Court said recently that the differences between policy makers and regulators mostly settle along two lines: one camp sees storage as a short-term necessity whilst the rest tend to view it as a future requirement. All agree that utility-scale storage is needed. According to IHS Markit Senior Analyst for Solar and Energy Storage, Julian Jansen, the emergence of storage as a distinct and important component of global energy markets has been building for some time. Jansen’s group has monitored stationery storage as a distinct market since 2013, and as part of the renewable energy/traditional utility ‘overlap’ years before energy storage grew to require individualized study. Jansen said the relatively rapid growth of energy storage in recent years came about for many reasons including the evolving nature of the technology (batteries, power management software, manufacturing capacity and so forth.) These factors enabled dramatic price decreases beginning in 2012. Jansen explained that prior to five years ago, even with widespread market appreciation for the role that storage could play for all types of energy grids and infrastructure, there were practical limits as to how much storage could be added to any systems due to costs, efficiency concerns and the fact that most battery-based systems five years ago were simply not cost-competitive according to many across the industry. This started to change as battery makers saw more opportunities for their products and companies working as system integrators sought to make buying a ‘complete’ solar photovoltaic (PV) power plant no more taxing than any other major purchase. 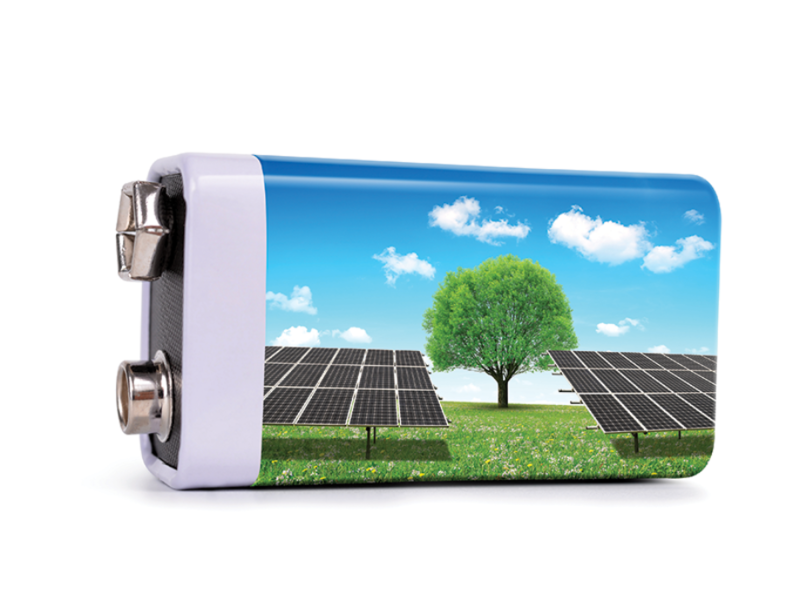 High efficiency energy storage offers residential plant owners the opportunity to optimize their investment by storing power generated during peak solar irradiation periods for use at night or other non-generating periods. Storage also represents an opportunity to condition power frequencies for seamless integration into the home environment with all its sensitive computer controlled systems. For utility-scale energy providers, storage enables them to ‘bank’ power for peak demand periods, and to also condition energy fed in from renewable power plants. The decline in residential and commercial-grade storage costs has been precipitous. IHS notes that since 2012, the cost of Lithium-ion battery cells has fallen about 70 percent at the same time that cells have become safer and efficiency has increased. Battery cell lifetimes also grew longer and the software/hardware to manage power systems and optimize performance has increased many times their 2012 levels. At the same time, HIS analysts decry the tendency of some market watchers to oversimplify this transition and the emergence of storage as a significant power electronics market. The linkage of storage growth wholly to the rise of intermittent renewables (wind power, photovoltaic (PV) energy, etc.,) is a mistake, says Jansen. He notes that to one needs to only look at the overall picture of how energy generation and consumption is changing to fully appreciate the phenomena. For example, even in markets with relatively low PV penetration and low electricity costs, legacy utility companies appreciate that energy storage has benefits for them, whether it is a better way to achieve frequency balancing, load leveling, or as a reserve power resource for unexpectedly high demand periods. “Energy storage can be seen as a key enabler for widespread penetration of intermittent renewables; however, explicitly linking energy storage only to renewables oversimplifies the picture. Especially as energy storage costs are coming down, the technology increasingly provides crucial balancing services and helps support constrained transmission and distribution networks,” Jansen remarked. “While microgrids have been a buzzword for years, it’s really now that battery energy storage has come down so much in cost that we can expect widespread adoption of microgrids for renewable integration, reduction of diesel consumption and the ability to island local electricity networks,” he stated.The expectation that storage will emerge as a significant component across global energy markets is creating economic opportunities; IHS projects that storage spending will grow significantly. Jansen’s group focuses on grid-connected storage options, noting that this segment alone (about 17% of the projected 2025 market,) will be valued at USD $7 billion in eight years—a 16 percent compound annual growth rate. While many factors contribute to the rise of storage in both traditional and renewable energy systems, falling battery prices and increases in quality, ruggedness, power density and reliability have been major factors, Jansen noted. One of the biggest changes has come in the way that lithium-ion (Li-ion) batteries have improved while costs fell 70 percent since 2012. Researchers predict Li-ion costs will fall below USD $200/kWh by 2019. “Really, it’s a range of factors, but by far the greatest is investment in Li-ion manufacturing capacity and R&D to improve performance, reduce cost, increase energy density, etc. This is particularly driven by investments to take advantage of the growing EV opportunity and the respective need for Li-ion batteries, which is the strongest driver for the future. We are also seeing heavy support and drive in countries such as South Korea and especially China into future battery manufacturing capacity,” Jansen remarked. As storage emerges as a ‘next step’ in the evolution of power generation and consumption, some may wonder if growth projections can be realized without the subsidies that enabled the global renewable energy surge. While the discontinuance of subsidies did affect residential solar/PV markets, simultaneous quality increases of photovoltaic components plus better grid-scale financing options led to the growth of utility-scale PV plants. Market forces that drove down the cost of solar panels are, in a similar fashion, affecting batteries and power management systems. Since energy storage benefits both traditional and renewable energy consumers, the lack of subsidies does not appear to adversely affect the viability of storage as a market, Jansen said. “The discontinuance of subsidies has been one major factor (in the decline in PV growth across Europe and elsewhere,) but by no means, the only one. Other major factors are: (1 AD/CVD duties from late 2013 that reduced module availability and maintained higher prices in Europe than in other regions, making solar less competitive without subsidies. (2 Retroactivity measures for older installations (reducing project IRR) in several countries that generated widespread investor lack of trust on renewables, which moved investment to other areas, and finally (3 it takes time to move from a FIT scheme to a tender scheme. In addition, even in countries with very good solar irradiation and high electricity prices, that is, countries with good conditions for so-called grid parity, the legal framework did not allow for such tenders or for creating independent IPP; it has taken time to change laws to bring new opportunities for solar projects,” he remarked. Making storage an important aspect of future energy generation and transmission is emerging as a key success metric for groups interested in both renewable and traditional energy. The REA’s James Court called energy storage ‘The Great White Hope’ for restoring growth in the UK energy sector after many renewables segments, and in particular solar PV, have been hit by support cuts from the government coupled with investor insecurity that cutbacks tend to create. Storage systems—approved by renewables advocates as well as mainstream power utilities, could turn that around, many believe. In markets not as penetrated by photovoltaic and other renewable systems like the United States, Jansen said even faster growth is expected. “Fundamentally, in many US states the drivers (for storage growth) are unrelated to renewable growth and are what enables the US to be the leading market for energy storage growth in the short-term future. Key factors include: Early growth in the PJM market driven by the ability of energy storage to provide frequency regulation; the creation of energy storage mandates or targets in states such as California or Massachusetts (with many states looking to follow-suit); the very specific rate structures in the US and especially in California that have enabled the C&I market to emerge; for future growth in the residential sector the revision of NEM policies / structures will be crucial; the needs for peaking capacity, which are more pronounced than in Europe (the Aliso Canyon gas leak is the best example here.) Finally, there is generally a greater risk appetite by investors in the US, as well as greater funding available for start-ups. This can often enable companies to put together business models and scale up more quickly,” he said. While focused on utility-scale storage requirements, Jansen also noted that the ability to store energy more efficiently and cheaply will impact residential markets as well. “In the long-term I believe that in the residential sector it is not about selling hardware (i.e. boxes with batteries,) but about selling integrated energy solutions to customers supporting the transition towards a distributed, low-carbon and digital energy system. Customer empowerment is key for the residential sector,” he concluded. DOES my battery look big in this? I posed this question in a blog 18 months ago, and nobody dared post a comment. There’s no doubt that size is sensitive. Industry is split. On one side are those who prefer the voluptuous, substantially oversizing their battery assets upfront. Others argue for a ‘lean and mean’ approach, planning to augment and possibly even repower later on as needed. But who is right? It’s complex because sizing affects so many different aspects of storage project development and operation. So, we pulled together the Everoze storage team into one room – a team which has collectively conducted storage site inspections, simulations of battery usage, EPC contract sup port and Financial Model reviews. We also brought in colleagues who pioneered the Life Extension Assessment Framework (LEAF) for renewables. 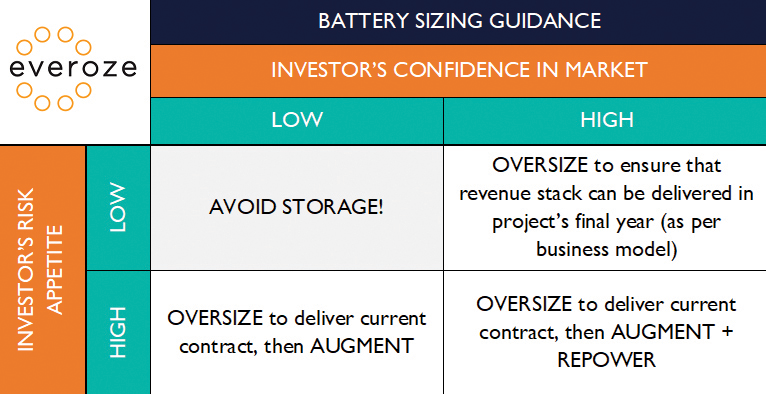 And we asked one simple question: what is the best approach to battery sizing: to oversize, augment, reduce and/or repower? This feature summarises our agreed position. Repower: Replace all onsite batteries, and potentially balance of plant too. These strategies are not mutually exclusive; in fact, two or more are often combined within a project’s life. i. To anticipate degradation: Every project needs a plan for dealing with degradation. MWh capacity of batteries inevitably decrease with time and usage, so the costs of dealing with this must be considered in the project’s base case. ii. To enable a revenue stack reset: Many projects additionally seek to retain the option to increase the energy-to-power ratio of storage plant longer term, to facilitate a possible revenue stack reset. Unlike degradation compensation, this is not an essential objective. Instead, it’s a futureproofing consideration, which might be either a base case or upside scenario. To frame this another way, when we talk about battery sizing, we need to be clear on what is the service to be delivered (current and future, base case and possible) and over what period of time? Oversizing is normally proposed as a solution for degradation only; it is less commonly proposed for revenue stack resets, because oversizing requires certain upfront capex, whereas the reset is a possibility rather than a certainty. By contrast, augmentation and repowering can be motivated by degradation anticipation or revenue stack resets, or both. 3. So – which strategy is best? Although multiple approaches are viable, let’s be clear: this isn’t a case of ‘anything goes’. Far from it. Another clear outcome from our workshop was the absolute necessity for upfront preparations during project development. For example, spontaneous augmentation in Year 5 will cause a real headache if your original design didn’t anticipate this in its layout, inverter configuration and cabling routes. Simply put, you need a plan that is both (a) technically credible and (b) consistent with the Financial Model. Is the degradation analysis robust? Has optionality been built into planning and land options? Does the EPC design reflect the intended approach? We could go on. There’s no doubt that size is sensitive. Industry is split. On one side are those who prefer the voluptuous, substantially oversizing their battery assets upfront. Others argue for a ‘lean and mean’ approach, planning to augment and possibly even repower later on as needed. But who is right? It’s complex because sizing affects so many different aspects of storage project development and operation. So, we pulled together the Everoze storage team into one room – a team which has collectively conducted storage site inspections, simulations of battery usage, EPC contract support and Financial Model reviews. We also brought in colleagues who pioneered the Life Extension Assessment Framework (LEAF) for renewables. And we asked one simple question: what is the best approach to battery sizing: to oversize, augment, reduce and/or repower? A very special word of thanks to those of you who attended our annual conference, Solar Ireland 17. It was an extraordinarily successful event and provided a high-level platform for the best and brightest minds to interact, network and engage in all matters solar. The welcome address from An Taoiseach Leo Varadkar and keynote address by Minister Michael Darcy set a gold standard for the subsequent 2-day discussion ably complemented by the experiences of former Energy and Environment Ministers Alex White and Alan Kelly. On FIT projects, Ofgem indicates that, unlike the RO scheme, the use of multiple meters to calculate net “renewable” export is not permitted. Without the right metering arrangements being in place, there is a risk therefore that the owner of an existing FIT installation would – following deployment of co-located storage – cease to be eligible to claim FIT export tariff payments and would only be able to secure revenue in relation to electricity exported to the grid via a commercially negotiated PPA i.e. the installation would effectively be treated as having permanently opted-out of receiving export tariff payments. There draft guidance confirms that, as a matter of process, Ofgem will only determine the acceptability of particular changes to an existing RO or FIT installation once those changes have been made. Other guidance from Ofgem indicates that scope may exist to reverse a change if determined to have an adverse impact on an existing accreditation. However, some owners and funders of existing projects might find it helpful for Ofgem to expand on this point in the specific co-location guidance and provide extra reassurance that, even if a particular co-located storage arrangement is not acceptable to Ofgem, existing accreditation will not be lost for good if that storage is disconnected and the original RO or FIT installation returned to its previous metering configuration. 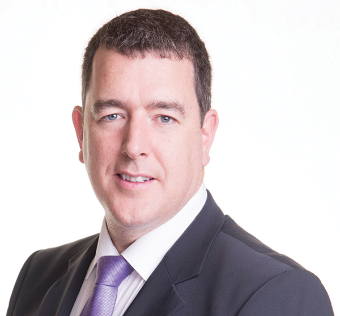 Everoze Partner, Paul Reynolds sees an opportunity for batteries under the DS3 reforms of system services in Ireland. Here are his key takeaways – how the system works, and what a winning revenue strategy looks like. Ireland is great. That goes without saying. Obviously, there are the people (especially my Irish wife! ), but less well known, is perhaps that Ireland is a world leader when it comes to integrating renewable energy into the grid. For batteries, the focus is likely to be on Fast Frequency Response (FFR), Primary Operating Reserve (POR), Second Operating Reserve (SOR) and Tertiary Operating Reserve (TOR1 & TOR2). Although the plan is to eventually to move to competitive tendering, services are procured through a panel based procurement process whereby if providers can demonstrate technical compliance they are added to the panel. Providers are then paid when available according to the following formula. The interesting part are the scalars. These give the system operators (SO)s flexibility to incentivise good behaviour or penalise bad behaviour, with different scalars applying to different revenue streams. If we focus on FFR, the most significant scalar is the scarcity scalar which is for FFR zero up to an SNSP level of 60%. 6.2 between 60-70% and 8.5 when the SNSP is above 70%. In other words, FFR is paid well at high penetrations of wind/interconnectors; but only paid at high penetrations. As we will see this makes a big impact on revenue uncertainty. All this means, assuming no performance issues, a battery could earn ~28x the base tariff at periods of 60-70% SNSP and ~38x for SNSP levels above 70%. But there’s a challenge. The time spent above this SNSP level will vary significantly from year to year. 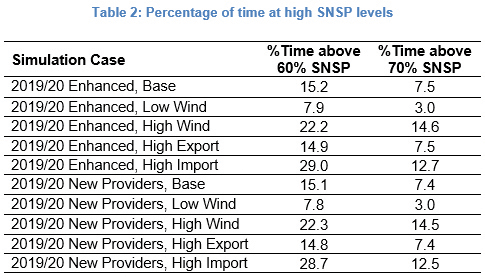 This is because SNSP level is a function of the generation mix, wind speeds, interconnector flows and demand levels in a given year. The table below shows system operator estimates for 2019/20 under two generation mix scenarios. As can be seen in a bad year you could be above 60% SNSP for 7.8% of the year. In a good year you are up at 29%. This is a huge variation, completely out of the control of battery developers. 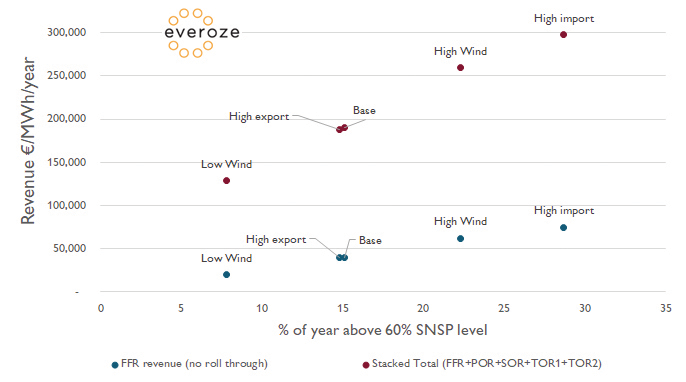 Putting all this together and with the SNSP limit increased to 75% and the ‘New providers’ generation mix, at Everoze we estimate that for a battery with no performance issues, a dynamic response within 0.5 seconds to a 0.02Hz deviation in frequency (up or down) and provision of FFR, POR, SOR, TOR1& TOR2 (20 min duration in total) then revenue could be ~ Ä300k in a good year and ~Ä128k in a bad year. This excludes consideration of other revenue streams which might be stacked in with this (e.g. payments under the Capacity Remuneration Mechanism). © Smart Solar 2018. All rights reserved.